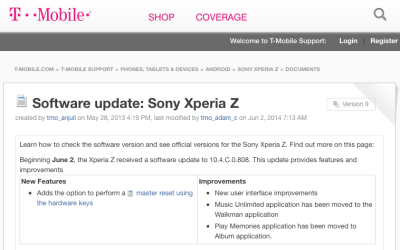 Any T-Mobile Xperia Z owners will be pleased to know there’s a software update waiting for them. Sadly, not anything major on the Android side. Instead, it’s a minor firmware tweak from Sony. Build 10.4.C.0.808 is now available to download from your Sony Xperia Z, and comes with a few Sony user interface improvements. Music Unlimited has moved to be integrated in to the Walkman app – like it is on the Z2 – and the Play Memories app has been moved in to the Album application. You can also perform a master reset using the hardware keys. For full details on the software update, head on over to T-Mobile’s support page. A decent update if you have z1s. Those who forgot their lock screen password prior to this update had to get a computer and download PC Companion just to master reset; Rather late on Sony’s part though. And where is kit kat?…Oh yeah still being ‘tested’ haha. KitKat sure is taking a long time. Most carriers have released it for the Z. There are battery drain and slowness bugs in the current KitKat release, so I am not too upset that T-Mobile hasn’t released it yet. Good things come to those who wait. I’ve given up waiting for T-Mobile to release updates for the Z. On Saturday I installed Sony’s generic C6603 commercial/journalist version of the recent KitKat release. I have seen the posts from people mentioning the battery drain and lag that appears when viewing the settings UI. They have found a work around for that. I have not experinced any of the issues that are being discussed on XDA. My phone is actually smoother than before. Battery life is also a bit better for me. I’m getting better performance when tethering to my tablet without having to use the T-Mobile app and I’ve noticed better network performance. I wouldn’t say the better network performance is from network upgrades either. I was testing everything out in the hour after I upgraded the software. That is when I saw better network performance. Good to hear. I am having the battery drain issue since flashing. I may flash the 6603 4.3 ROM first, Root, then flash 4.4.2 . I have read that fixes my issue. I dirty flashed from MIUI. Update: This battery drain fix is showing promise. I have installed it and Google Framework is showing very little battery usage. Also my GPS is working much better. Time will tell. Update on the cricket wireless (aka ATT) plans: you do not get the group save discounts in addition to $5/month off. I checked on my computer sony app for the update. The update is actually 10.4.C.0.814. I just got the 4.3 update on my xperia z its10.4.C.0.808. I got the .814 version as an OTA (no PC intervention) yesterday. No major issues although they gave me a new Alarm Clock tone. I’m surprised the .814 isn’t listed on the TMo support page, though. yes, it is 4.3 for the ones who want to know, I just updated the phone and im surprised to know is 4.3, Jesus , always late, now we are still where we were before, 2 updates behind. dammit Magenta! I get the notice saying it’s available, download it, but the install fails. You have use the Sony software on the of PC to install it. I had the same issues. Thanks. Did it at work and it installed perfectly. worst phone ive ever owned.